Entering the post September 11 era of 2001, many American cable systems experienced mysterious, very annoying pulse-type interference on certain satellite pictures. Digital satellite transmissions may suffer complete fade-outs. 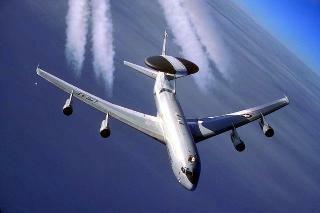 Meet AWACS, which is an acronym for the military's Airborne Warning and Control System. It operates special airplanes, patrolling up and down the coast of the United States, focusing on major metropolitan areas. These airplanes fly 20 to 30,000 feet above ground and operate powerful Pulse Doppler radars with very narrow (short) pulse-width. The 10 GHz radar antenna scans mechanically the terrain at six revolutions per minute (10 seconds/revolution). It is not an industry secret that a high-quality, 3.7 to 4.2 GHz bandpass filter, installed between the parabolic's feedhorn and the LNB should provide the necessary filtering. But how about those large pulses falling within the 3.7 to 4.2 GHz band? Unfortunately, a bandpass filter provides no protection against in-band spurious signals. The US AIR FORCE planes carry 30 feet diameter and six feet thick rotating radar domes. The radar has a range of more than 250 miles. The radar created interference has a range of more than 400 miles. 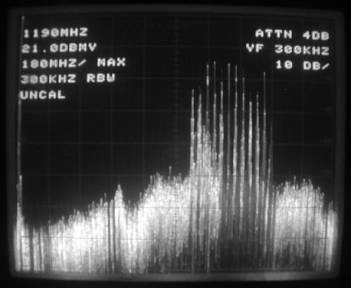 Returning to CATV system conditions on the ground, the photograph below shows the downconverted 950 to 1450 MHz Galaxy 5 spectrum, with the analyzer operating in the 100 MHz/Div horizontal scan and 10 dB/Division vertical deflection mode. 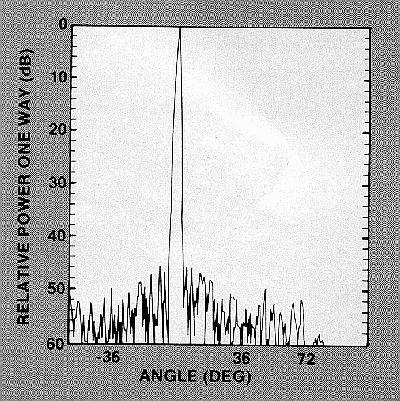 Observe the noise floor (bandwidth) of the LNB. It is much wider than the 500 MHz designated to C-Band. An ideal bandpass filter would pass the desired 3.7 to 4.2 GHz transponder spectrum without attenuation, eliminating the interference outside of the desired 500 MHz frequency range. Such an ideal bandpass filter does not exist. A one-stage filter guarantees the lowest insertion loss, probably in the 1 to 2 dB range, but its skirt selectivity is very shallow. On the other hand, the selectivity of a multi-stage bandpass filter would be quite acceptable, but at a price of high insertion loss. A low-loss bandpass filter, inserted into the front of the LNB would reduce the Carrier/Noise ratio by 1.5 to 2 dB. In satellite reception even 1 dB reduction is undesirable. To compensate for this Carrier/Noise ratio reduction, re-orient the antenna in the horizontal and vertical plane, increasing the desired carrier level. Then, turn your attention to the issue of polarization isolation, eliminating or reducing the crosspolarized transponder carriers from the spectrum. Improvement in crosspolarization isolation will boost the amplitude of the desired transponder carriers, improving the Carrier/Noise ratio, as well as reducing the noise in the adjacent channel. The above GALAXY 5 spectrum, photographed in one of the New York state systems, shows a spectrum with exceptional high polarization isolation. Turning our attention to a situation when the interference falls into the 3.7 to 4.2 GHz frequency range, reception conditions may become critical, but not hopeless. Airplanes, flying at 75 miles and circling at 25,000 feet, appear to the observer on the ground just about one or two degrees above the horizon. From flights at 150 miles or further, the radar signals arrive just a tiny bit above the horizon, practically 0 degree elevation angle. Shouldn't a high quality 3 to 5 meter diameter parabolic antenna, exhibiting a narrow main beam, provide 40 to 50 dB protection 15 to 20 degrees off-the-main beam? 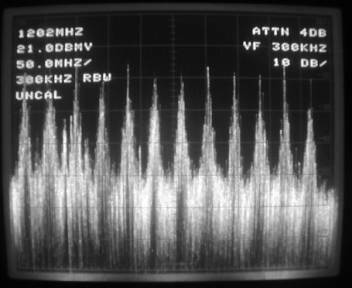 If the antenna is still receiving radar interference, it is a strong indication that the advertised perfect radiation pattern is less than perfect. (See picture below). When the receiving antenna is a multi-feed model, replace it with a single, prime focus configuration. Change to larger diameter prime focus parabolic. Larger the diameter, narrower the main beam, and side-lobe control is improved. Build a barrier in front of the parabolic, or plant high density vegetation (hedge), as illustrated on the picture below. Microwaves, arriving at 0° elevation angle, cannot penetrate earth or high density vegetation. The height and position of this artificial barrier in front of the parabolic is critical and should be carefully calculated. No room for mistakes! In October NATO AWACS have taken over the aerial surveillance, replacing the American aircrafts, which were transferred to the Afghan theater. NATO interference intensities are matching those of the US Air Force radars.